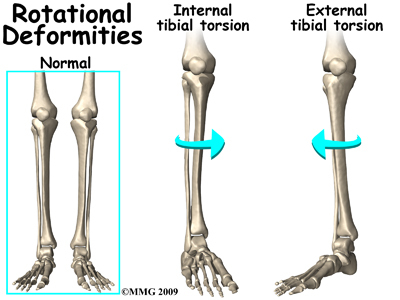 It is a rotation of the lower leg bone (tibia) excessively inwards relative to the upper leg bone (femur). It may also be due to an internal twist of the lower portion of the lower leg bone (tibia) relative to the upper portion of the lower leg bone (tibia). Usually noticed between the ages of 2 and 4. It is the most common cause of intoe in the 2 to 4-year-old age group and the condition usually resolves by age 8. Sitting and sleeping postures (picture below) may perpetuate the problems but generally do not cause them. At the end of the day when fatigue sets in the intoe appears to be worse. May be asymmetrical (one side worse than the other). A child that is tripping and falling or has a posture that is excessively turning in will benefit from a cast that goes above the knee. During the cast application the lower leg bone is gently rotated externally relative to the upper leg bone. This helps to stretch the ligamentous and musculotendinous structures around the knee. Cast may be utilized for 2-6 weeks. This will rapidly help the normal physiologic unwinding process of the lower leg bone relative to the upper leg bone. It is rare that an operation is performed for this condition. If the deformity is excessive causing tripping and falling and there is a significant cosmetic concern, surgery on the lower portion of the lower leg can be performed to externally rotate the foot. Clinical photograph of an infant with internal tibial torsion. The leg (below the knee) appear deviated internally and slightly rotated internally as well. The photograph below depicts an adolscent child with the similar type of structural changes with internal deviation of the tibia with interna rotation causing the feet to also turn inward.